260s are the targets which got to be chased in One Day Internationals particularly when they are played in subcontinent-esque conditions. Pakistan were humbled 130 all out in pursuit of target of 261 set by England in 1st ODI of four-Match series at Abu Dhabi. Their bowlers, spinners in particular, did not perform that bad. It was their batting which did them all humiliation. Irony is teams strengthen the department where they are infirm but Pakistan, in second ODI, further curtailed their batting, the weaker department, by replacing Shoaib Malik, a player who can bat, with specialist bowler Abdur Rehman, whose inclusion meant Pakistan would, this time, reduce England for runs 10 less than of first ODI total but that specialist bowler would, later, score 1 off 12 balls when 44 were needed to win off 34 balls. Last time, I witnessed such a horrible display of batting was 1 run off 9 balls by Rana Naveed and 4 off 19 balls by Wasim Akram. Pakistan lost the second ODI by 20 runs and just before it happened their number 8 batsman batted 12 balls for nothing. Now spare a thought for a team-member who could bat in late order and also bowl even as an opening bowler. Had those 12 balls been faced by Hammad Azam -who came of age playing such innings in chases during U/19 World Cup 2010 – the result would have been totally different. 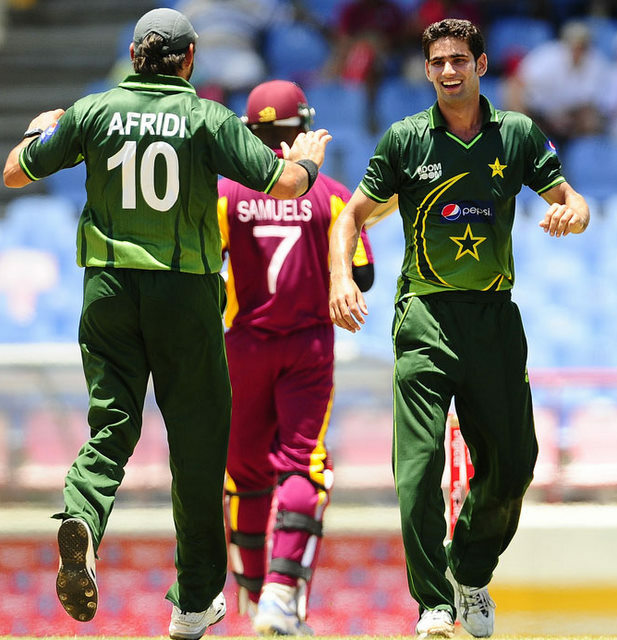 In third ODI during their tour to West Indies last year, in chase of 172, Pakistan were reduced to 12 for 3 and then 49 for 4 but Hammad Azam’s effort of 36 and his partnership with Misbah-ul-Haq of 78 runs assured Pakistan will neither lose match nor will they let slip a chance to get unassailable lead of 3-0 in five-match series. Azam, after that match, wasn’t given proper chances to prove his worth. Beyond any shadow of doubt, Hammad Azam deserves to be in this team which badly needs a batsman in their lower order. Moreover, he can also play as second seamer along with Umar Gul. Azam had to be selected in place of Aizaz Cheema in second ODI. Abdur Rehman’s inclusion in place of Shoaib Malik was, also, a fine move as England batting is prone to surrender against spin. Influential players Shoaib Malik and Imran Farhat must be cut off sooner rather than later to make way for the deserving ones. Calling for Farhat’s head, at the moment, after his 47 in second ODI, might sound harsh but in broader spectrum of Pakistan’s interest: Asad Shafiq should have not been dropped and could have been asked to open the innings. Farhat’s 47 will give him some sympathies and might distract many but with foresight of better option, Asad Shafiq or Azhar Ali as opener, he will have to pave way for them. Leaf can be taken out from India’s batting-order which – to accommodate and build up, for future, the trio of Suresh Raina, Virat Kohli and Rohit Sharma – leaves either Virender Sehwag, Gautam Gambhir or, even, Sachin Tendulkar. In World Cup 2003, Andy Bichel, selected in place of injured Jason Gillespie, grabbed 7 wickets against England and scored match-winning 34 but Ricky Ponting made it clear should Gillespie get fit Bichel will be dropped as Gillespie at any day was better option than Bichel. Misbah-ul-Haq must realize the role of other players and their prospects before getting distracted by Imran Farhat’s 47 off 71 balls. Asad Shafiq doesn’t deserve to be dropped and Azhar Ali, too, has shown glimpses of ODI batsman. Asad, who has opened before for Pakistan and also for his domestic teams, must go as opener with Mohammad Hafeez while Azhar, Younis Khan, Misbah-ul-Haq, Umar Akmal must develop the middle-order and Hammad Azam, Shahid Afridi the late order. Afridi, Saeed Ajmal, Abdur Rehman are to play role of the three major bowling options and the remaining 20 overs can be shared among Mohammad Hafeez, Hammad Azam and Umar Gul. Dream of winning ODI Series against England is dead. All Pakistan can do is salvage pride by winning next two games to square the series 2-2, the result they achieved in their visit to England in 2006- first match of 5-ODI series was washed out, next two were won by Pakistan and other two by England. Right combination in coming Twenty20 internationals will also give Pakistan a chance to become Number two in ICC Twenty20 Rankings provided they drub England 3-0. Pakistan have not won an ODI Series against England since 2005 and a Twenty20I series since 2006, which was also Pakistan’s maiden Twenty20I series. After an emphatic and vivid Test series win (3-0) against England, Pakistan have started limited-overs leg in doldrums but raising doubts on Misbah’s ability to lead ODI Team will be quite presumptuous as, under his leadership of late, Pakistan won ODI series by 4-1 against Sri Lanka, a world cup finalist, and also clean swept Bangladesh – who does surprise visitors at their home – without any major hiccups. It’s the selection where Misbah needs to be ruthless and not diplomatic. Neither it was his defensive batting which cost Pakistan second ODI nor that careless shot by Shahid Afridi, as expecting Afridi to play defensive is as illogical as asking Misbah to get aggressive. That’s how they both have won matches for you in past. An over ago, Afridi – with that Six and Four off Samit Patel’s bowling- was hero and had he connected couple of such shots in Anderson’s over, he would have been a superhero. He had to take risk to dwindle the asking rate. It was team selection which was perpetrator and this issue, seriously, needs to be fixed. An all-rounder who can bat must be inducted in. Hammad Azam, in all likelihood, is a perfect choice. Deserved players deserve to be in team. Nepotism has to end. An ideal Pakistan XI can be: Mohammad Hafeez, Asad Shafiq, Azhar Ali, Younis Khan, Misbah-ul-Haq (c), Umar Akmal (w/k), Hammad Azam, Shahid Afridi, Saeed Ajmal, Abdur Rehman, Umar Gul/Wahab Riaz. Pakistan will suffer as long as there is politics in the game. Every one talking about selection of players which is also important but I think Misbah didn’t use available resources properly. I feel there is lack of aggression in his captaincy. He didn’t apply pressure while spinners were operating, spread the filed which costs too many singles in order to make easier for England to keep their score board moving. As far as selection is concerned Asad Shafiq not a bad option even better in place of Imran Farhat. But on other side problem is that who will bat on one down position. If you ask Azhar Ali to do the same it will cost you badly because Azhar Ali, Misbah, Younus Khan are the batsmen who bats on same pace. Specially Misbah and Azhar. Asad Shafiq needs some support because I think he his not playing his natural game. One more than thing Pakistan need is a fast bowler allrounder. We haven’t seen much of Azhar Ali in ODI Cricket. Its not right, so far, to say that Azhar will play slow in ODIs. He played slow in last ODI but that was according to situation. Misbah can also shift gears. And if you have noticed, since the advent of two new-balls, batsmen don’t pile those much runs which they used to do. Even on good batting surfaces, runs aren’t coming with new balls. Azhar Ali also can be used to negotiate new ball. you miss an important point of wicket keeper-for me it was a blunder to drop sarfraz.i dont know why adnan was selected for odi.he is in the team but i am sure he will not get a chance due to his inability to bat.if sarfraz would have been in the team then he must get a chance in 3rd odi . umer dropped costly chances but we cant drop him now because we dont have other option. With lack in batting depth, its very hard one to debate whether Pakistan must go with specialist keeper or not. But even Sarfaraz haven’t done well enough with bat in international Cricket. Adnan somehow played well in Tests. But I think Pakistan must look to groom Umar Akmal as specialist keeper it will give Pakistan luxury of adding an extra batsman or bowler just like South Africa do in presence of de Villiers and India in MS Dhoni. vry niCe Mazhar……n0thing t0 Say bUt i m really Vry sUrprised t0 see Sh0aib Malik in team and MisbaH mUst think agresively by Making Umer to bat 0ne d0wn and Hamad f0r Cheema…..!!! It’s such a pity that Pakistan taking down England 3 nil in test series is struggling in ODIs.I think they need to set the combination right and Hammad Azam is the right ingredient for that but i’m not so sure about he’s selection in 3 ODI,my gut feeling says Pak will go with the same side in tomorrows game. Nasir jamshed should be selected for the T20s. He has proved his worth in BPL and not just T20s,he should be considered for ODIs as well.I know the last time he was selected,he performed poorly but looking at him in BPL, gives me goose bumps! Indeed a very well written article. im impressed the way the writer has given his views on the selection. i very well agree with him on the selection issues. keeping abdur rehman in the second ODI was a true disaster. just to get one spinner we totally destroyed the batting line up. 10 overs from Ajmal , 10 from Hafeez , 10 from Afridi are worth watching and thats all we need. next 20 overs should be given to seamers ofcourse and certainly hammad azam is not a bad option. i have seen his domestic performances as well as westindies odi , he has the potential. a youngster along with umar akmal can strengthen the batting order. also the concept of bringing afridi in late order is of concern. if we have initial scorers then chasing is not an issue. bring in afridi and hafeez to open the innings. then it would be a fighting innings. we need aggression in the early overs so that even if we lose wickets the middle order doesnot have much pressure. also younis khan should be given a warning. a senior player like him being so unpredictable is a disaster. when we need our batsmen to perform we are let down and the only solution to it is to have a proper BATTING COACH. @Zainab- I am not against selection of Abdur Rehman as he is a bowler who can strangle England batting and will exert pressure. Problem occurred when he was selected in place of a batsman. Shahid Afridi can be used as an opener but question is: will Afridi want to? Afridi has opened with Hafeez in New Zealand and that series were worth watching. Werent they? Even today Afridi scored Reasonable while Hafeez was Ok too and if they both had opened the innings i think we could have easily made 250. One more problem is the use of DRS. today Hafeez’s LBW was a clear not out and if we would have used DRS i guess he could have got a fifty as well as he was well inform today but just got unlucky. Im not saying that strong openers will help but yes they will make a difference if kept. Imran is really unpredictable. And if the Captain wants i dont think Afridi would have any issue as an opener. Its the fate of the team. Batting crisis is leading to its downfall and if we need to save us from Whitewash it is only the batting that will save us. Talking about deserving players help me remind when was the last time that Younas played a good ODI innings against a formidable opponent. He has played his part amd we need to look forward for the next World Cup and induce fresh blood asap. Younas needs to make way for the youngsters! Issue of specialist keeper is hard one to debate. Some 3 or 4 years ago, I was also in favour of specialist keeper in ODIs but not anymore. Cricket has been changed. To accomodate a batsman or bowler, we have to groom someone who can also keep. Look at South Africa and India, due to Dhoni and De Villiers they have luxury of adding extra batsman or bowler. Umar Akmal’s fumbles might cost us matches at the moment but in long run, when he gets developed as a keeper, it will help Pakistan a lot. However, in Test Cricket. Keeper must be specialist. I really appreciate you on this article, i saw 1st article of yours and i can feel that you have complete knowledge of cricket and you know what is cricket….!! May be i disagree with one player but still u make me feel that you understand cricket… Other wise people just say what they want even they don’t know what they are saying….!! Tell me what are your views on this Squads?? I am not talking about this series, talking generally…!! You have mixed up all the squads. Not getting which players you have selected for which format. But I think Adnan Akmal has done a good job as keeper. Sarfaraz Ahmad needs to improve his batting at international level. You dont want Afridi in T20’s ?? STRANGE !! This is a very good piece! Keep it up! I think Aizaz Cheema is better option then umer gul. Afridi shoud open or batting on no. 3. My team is Hafeez, Afridi, Asad Shafiq, Younus, Misbah, Umer, Adnan, Hammad, Rehman, Saeed Ajmal and Cheema. I think mazher bhai this is the right position and team for Pakistan. Afridi can’t do nothing in coming late in batting order because he always ruined match for Pakistan he played nearly 350 matches but does’nt take responsibility in Batting only his ability of making 15 to 20 runs and if he makes opening this will be very effective. Azhar ali not suited for ODI because with younus, Misbah we can’t afford another slow player. @Kamran- Shahid Afridi, I think, himself doesn’t want to come as opener even in Asian conditions. He can play good late down the order particularly in power plays. Cheema has the pace but lacks ability to bowl yorkers like Umar Gul and Wahab Riaz. I somehow agree that its hard to put Azhar Ali and Asad Shafiq both in squad in presence of Younis and Misbah. But guess after 2 or 3 years, Younis and Misbah will be retired so we have to groom someone who is solid in middle order.